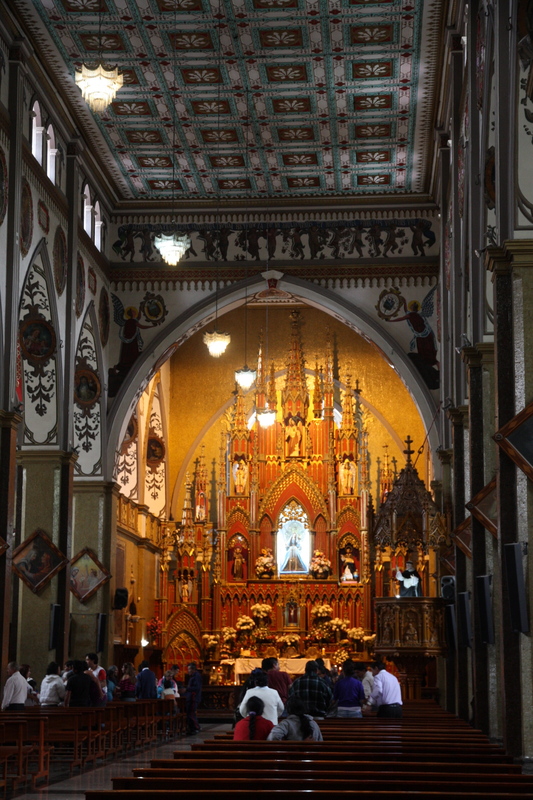 An important church in Baños | Where to next? I have no idea how many churches we’ve visited on our travels, but I haven’t yet shared much about many of them. One that caught my attention recently was the Church of the Virgin of the Holy Water, Nuestra Señora del Agua Santa, in Baños in the Andean highlands. This is a place of pilgrimage and awe. Not long after Dominican fathers founded the small town, a clerk saw the image of the Virgin Mary, accompanied by two angels, leave the small hut that was serving as a church. She appeared to the priest the next night and said a church should be built so she could heal the sick. The church was started in 1904 and completed 40 years later. It’s built of volcanic rock and in a Gothic style. We visited on a Monday morning during a Mass (there are 29 services each week with nine on Sundays), so were reluctant to roam the interior. We were able to admire the beautiful artworks on the wall and ceiling, and to see the many murals depicting miracles by the Virgin. These included scenes of a car accident, a horse and his rider falling from a cliff, fires and many eruptions from the Tungurahua volcano. The church serves as a place of shelter during eruptions. It is said that people stay in the church come out unscathed. Street scenes of Baños in the Andean highlands « Where to next?